John Judge is a researcher and lecturer on many topics from covert operations to political assassinations such as JFK and Martin Luther King. He has co-founded many commitees including the Committee for an Open Archives, Committee for High School Options and Information on Careers, Education and Self-Improvement (CHOICES) as well as 911CitizensWatch.org in which he played a pivotal role along with 9/11 victims family members in demanding a transparent investigation into the attacks of September 11 2001 by the 9/11 Commission. 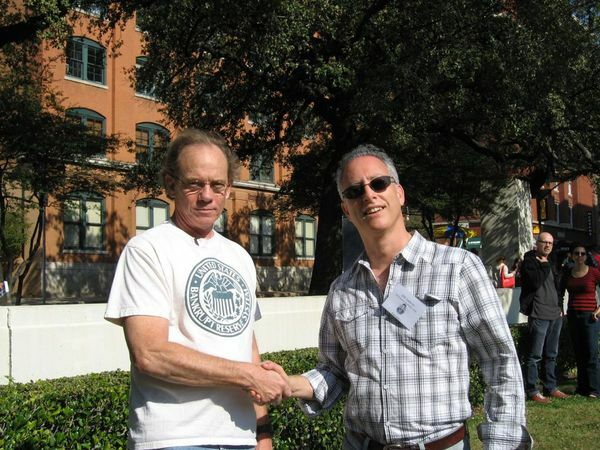 John has a website http://www.judgeforyourself.us/ and continues to work on 9/11 research projects in an effort to bring justice to the victims who died in the atrocities that took place on September 11 2001. I had a chance to talk with John the other night about his research and experience with the 9/11 Commission Report as well as other various issues of importance. Evidence means nothing to people hell-bent on protecting their pride. Flicker on Sun, 08/01/2010 - 7:19pm. this interview is an audio history/compendium of 9/11 evidence and questions: 9/11 Commission conflicts/omissions, families struggle for answers/accountability, air defense standard operations and 9/11 failures, foreknowledge, CIA history of using Islamic radicals as proxies, unanswered questions about hijacker identities, Able Danger, Anthrax questions, parallels to JFK/RFK/MLK assassinations/coverups, US foreign policy, history of manipulation of public opinion through terror, half-truths and lies since WW II- etc. I don't agree with John that the WTC destructions can be explained simply by plane damage/fires- the NIST reports are evidence of obfuscation/cover up- but I don't think everyone needs to focus on that either- his background is in research on covert operations, assassinations and US foreign/domestic policies. He was essentially railroaded out of the truth movement in the mid-2000's by people convinced that he's a shill, cuz everything important about 9/11 is swapped planes/faked calls/missile hit the Pentagon/93 shot down/WTC CD. The WTC destructions are one part of a huge plot, which itself is one part of a long history of elite corruption and manipulation of the public for war and profit. The biggest questions about 9/11 and the way the world works are who's responsible, and how can the system be changed so that it's transparent and accountable to the public, so that high crimes cannot be gotten away with, and so that the system serves the public interest. loose nuke on Sun, 08/01/2010 - 10:22pm. Shocking failure at the end. I have really enjoyed listening to the authoritative John Judge previously in 9/11 Press for Truth and in this over two hour interview. There is a lot of good, original information here too, even though I found some of it to be very questionable. For example, he claims that firefighters may have created the inner ring "punch through" at the Pentagon and that some sixth hijacker on Flight 77 explains away the Hani Hanjour problem. However, I still can not believe what he says in the last 15 minutes or so, about 2:07:00. While what happened at the Pentagon is up for debate, the demolitions of the three WTC high rises are well beyond any serious dispute and irrefutably provable numerous, distinct ways. As one of thousands of credentialed engineers who know for a fact that the WTC skyscrapers were demolitions, I feel a little insulted by these sorts of baseless assertions as put forward by John Judge. Although I sincerely hope John Judge continues his fine work on deconstructing the 9/11 Commission and its bogus report, and I am sure he will, I also hope he will refrain in future from making such absurd statements that he is so clearly unqualified and otherwise unable to defend. In short, it is shocking to me but quite obvious that John Judge has no grasp of basic spatial relations, e.g. WTC 7. How anybody, otherwise so diligent and intelligent, could fail to understand the clear and simple presentations at AE911Truth is beyond me. bofors on Mon, 08/02/2010 - 4:11am. Likewise, I was a fan of John Judge's previous commentaries. But his remarks at the end of this interview bewilder me. I think labeling him as a shill is a bit extreme and premature. My hope is that he is merely preoccupied with himself and his chosen path of investigation. Thanks, bofors, for chiming in. IMO the evidence for explosives at the WTC is as solid as anything Judge has put forth. Similarly, Judge is not immune from speculation. And it could be equally stated that "we know what didn't happen" to the WTC towers in the same way that Judge "knows what didn't happen" at the Pentagon...... more so IMO. And while his work with COPA may be admirable, his claim that they "blew the JFK case open" is exaggerating, to say the least. I don't recall anyone or any entity in the mainstream acknowledging the discoveries and conclusions of COPA. If the public doesn't believe the Warren Commission story, they are still going along with it. It's now clear to me that one thing that distinguishes 911T from JFK researchers is our determination to change people's minds and not simply collect some incriminating facts that will likely go nowhere. I'm not happy with Judge's remarks, but I'm not calling him a shill either. He has contributed a lot and continues to do so. The fact that on blogs like this we see clearly where he falls short is an indication to me that the truth movement is well-grounded and can easily weather a little mis/dis information. Should we challenge him? Yes. Should we label and attack him?" No. Should we bombard him with CD info? No. He's smart enough to look into it himself if he chooses. 911Peacenik on Tue, 08/03/2010 - 2:16pm. "He was essentially railroaded out of the truth movement in the mid-2000's by people convinced that he's a shill..."
I had not known this, but I am seeing enough here to get the idea that that is a possible explanation for this bizarro interview myself. bofors on Mon, 08/02/2010 - 4:16am. I can see why truthers can not trust J. Judge. jonathan mark on Tue, 08/03/2010 - 7:16am. Linked to no planers disinformation too? This interview with John Judge was originally posted on Pumpitout.com. The Pumpitout.com website prominently links to a yet another absurd "no planer" video called "Continuous Pieces 9/11". What has happened to this website? This sort of crap should not be on 911Blogger at all. bofors on Mon, 08/02/2010 - 4:52am. I'm pretty shure the guy who posted this is the one who phones witnesses up while he's drunk and shouts at them. influence device on Mon, 08/02/2010 - 5:18am. But you obviously haven't watched the video becasue it has nothing to do with what you are claiming! shure on Mon, 08/02/2010 - 9:25am. from the C.O.P.A Convention in Dallas. But, the JFK Lancer Convention held on the same weekend welcomed us and we received many many thanks. Joe on Mon, 08/02/2010 - 8:15am. dtg86 on Mon, 08/02/2010 - 8:53am. You can find links on John Judge's website. 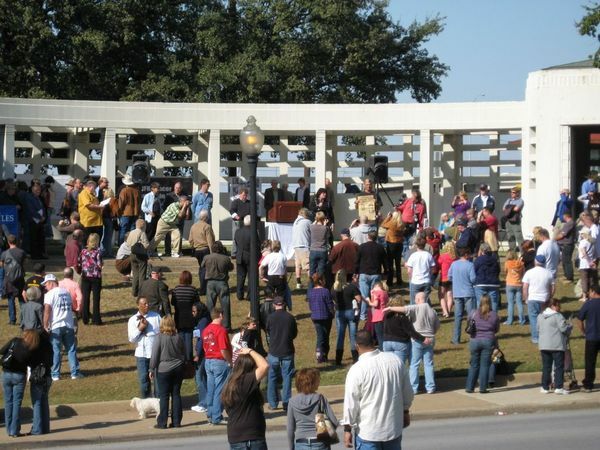 http://www.judgeforyourself.us/ COPA has annual JFK assassination regional meetings in Dallas in late November. EXAMPLE: "Sixteenth Annual Regional Meeting of COPA - November 19-22, 2010 - Dallas, TX"
TomT on Mon, 08/02/2010 - 9:46am. Thanks Tom for filling me in, its much appreciated. I was listening again and just realized I heard Mr. Judge say that he SAW the official manifests as released by the airlines and was able to compare the list of victims that were identified against it. From here, the names not identified matched the number of hijackers? Did I miss something? No one has produced an official airline manifest from any of the 4 planes that day or am I badly mistaken? What were the left over names if they were not arab? If the hijackers names were not on them, then how were they on the planes? A great interview shure, but can you follow up on this line of questioning? dtg86 on Mon, 08/02/2010 - 7:59pm. C.O.P.A. - Last November - Dallas. Our "North Texans for 9/11 Truth" Group had asked John Judge: "What is the criteria for having a table at your COPA Dallas Event?" 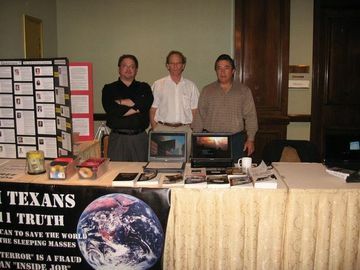 However, Joe and other 9/11 Truthers organized a very successful tabling exposure at the JFK Lancer Convention. 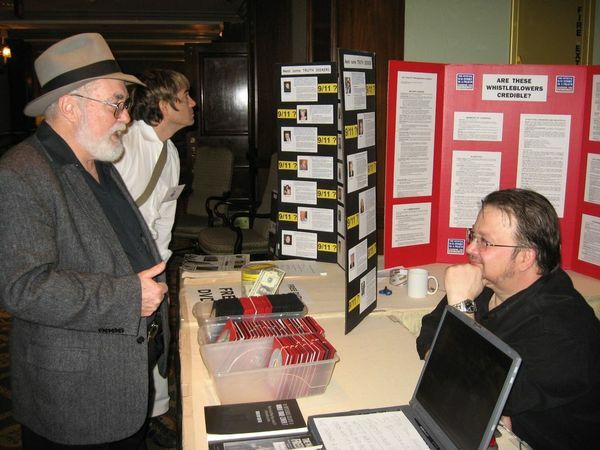 Jim Marrs and Russ Baker, along with many other researchers, were happy to see our 9/11 Truth group disseminate information. TomT on Mon, 08/02/2010 - 12:44pm. for filling in the details. Joe on Mon, 08/02/2010 - 2:12pm. Glad to see Russ Bakers support. I wish he would dig in to this material a little more deeply as he has a knack for uncovering very interesting information. zombie bill hicks on Mon, 08/02/2010 - 2:19pm. including Kevin Ryan, B Zwicker, AE911Truth, Core of Corruption, Between the Lies, DRGriffin. how he would need help. Joe on Mon, 08/02/2010 - 2:25pm. And about the flight manifests--no actual manifest from those flights has been made public (the FBI claimed a doucument submitted in the Moussaoui case was derived from one of the flight manifests, but there's no way to check the veracity of that claim without the actual manifest being produced). So if Judge saw one, I can only ask (as when Davin Coburn claimed to have been shown photos from the Pentagon strike that weren't released to the public) whe he should have privileged accuss to such materials that the rest of us are being denied. Notwithstanding loose nuke's comment above, it seems to me there's more involved in the rift that grew between Judge and the 9/11 truth movement than some supposedly excessive attachments to topics like 'swapped planes,' 'faked phone calls,' etc. rm on Wed, 08/04/2010 - 1:41am. They disagreed with us, they paid the price. Like Scientology says: "Fair game!". P.S. shure a.k.a. Jeff Hill used to be a no-planer. Don't forget to keep rubbing it in his face, although he's vociferously changed his mind. SnowCrash on Tue, 08/03/2010 - 12:22pm. Adding or excluding people from a movement should generally be avoided, as doing so is counterproductive. Getting a new, legitimate investigation should be the objective. If John Judge sees enough problems with the official story that he feels that a new investigation is needed (and it appears that he does), he should be welcomed as someone to help push for that investigation. Personal opinions on the evidence are just distractions from the main objective, which should be getting an authoritative investigation. Wildbear on Tue, 08/03/2010 - 5:03pm. SnowCrash on Wed, 09/15/2010 - 5:44pm. Joe posted an entry above with a photo from the Lancer event with the heading: "Last November J Judge told us to stay away..."
I am bumfuzzled why some people voted it down. TomT on Tue, 08/03/2010 - 3:21pm. BTW I will probably be at this years JFK Lancer Convention doing it again. Not at COPA. Joe on Tue, 08/03/2010 - 6:25pm. I will be there with you, disseminating 9/11 Truth. TomT on Tue, 08/03/2010 - 10:08pm.